If you are – or work for – a non-profit, you already know how important events are. They help further a non-profit’s fundraising, awareness, and advocacy efforts. A common mistake is to put hours of planning and work into the actual event, but relying solely on sending invitations to get people there. Instead, use your event to actively grow your non-profit’s reach, establish new connections, and advocate your cause. This will allow you to meet your ultimate goals of increasing awareness and donations and gaining volunteers. Here are five practical tips to help you promote your next charitable event. I’ve also included a worksheet (at the bottom of this post) so you can put these tips into action right away! Not all events are created equal, which means not all events will draw the same audience. Most non-profits know who their large donors are, but they don’t know who will attend their events. Best way to start? Write down who you would like to attend your event. Then, do some research on their characteristics, such as gender, age range, income, education level, industry, etc. The more details you learn the better. Now that you know who they are, you can start thinking of creative ways to reach them. For example, an upscale gala would require different promotion avenues then a “Fun Run” for kids and families. One of the best ways to promote your event is to use your existing audience to help spread the word. Consider creating “tag a friend” campaigns or group and friend rate promotions. Use these vehicles to ask questions that will help you learn more about your audience and their views. Focus on empowering and engaging your audience in your cause and event. Through word of mouth, you open yourself to more resources, contacts, and information. Another way to leverage the power of connections is by joining forces with other organizations that have a similar mission statement as your event. Collaborating with similar groups can increase the impact of your message and expand your donor base. Does your organization have a blog? Or do you have an event website? If you don’t, this would be a great time to consider one. You can share content about things related to your event: everything from major event announcements, behind-the-scenes blog posts, the impact your charity has in the community, and where the funds raised at the event will be applied. Use your blog or event website to engage your audience, and ultimately increase the number of attendees. Here’s an example of what an event website might look like: Fundraiser Gala Site, plus you can find additional suggestions in the worksheet! The best part of social media marketing is the platforms are free – perfect for a non-profit’s budget. With a little effort, you can communicate and promote your event details to your ideal attendees. My three favorite platforms are Facebook, Twitter, and Instagram, but these tips can be applied to other social media platforms, too. – Create an event, complete with who, what, when, and where. – Share the page with followers, friends, family, and coworkers that would fit your ideal audience. – Keep the page updated, and keep your audience engaged (see ideas in #2). – If your event is paid, link to the webpage where they can purchase tickets and reserve their spots. – If your event is education or networking based, you should consider creating a private Facebook group for registered attendees. This way you can share pertinent information and attendees can network with each other pre-event. – Create a targeted Facebook ad set to promote your event (use your research on your target audience from #1). – Be sure to download the worksheet (link below) for tips on how to use Facebook to create an event, a private group, or create a Facebook ad to promote your event. Twitter is a great place to create a buzz about your event and cause, gain new sponsors, find vendors, and increase your event’s attendance. – Create a hashtag for your event (#thiseventwillrock). – Promote your event with updates, announcements, and images. Be sure to use your hashtag so people can become familiar with it. – Promote and publicly thank vendors, sponsors, keynote speakers, and event organizers by tagging them in posts. This will allow you to reach a larger audience faster. – Retweet tweets that mention your event or organization. – Tweet live from your event with posts on pre-event preparations, interesting happenings during the event, and behind-the-scenes action. – Mention the details of your event often. You can do this creatively in the text accompanying your image posts. – Use the active link in your profile and make sure it links directly to where people can RSVP or buy tickets to your event. It’s important to make it clear and easy for people to sign up. – Use appropriate hashtags, such as location, cause or topic, your event hashtag, and hashtags created by brands with similar audiences. – Consider “tag a friend” posts (double your reach!). – Share the stories of the charity that your event will fund. – Post pre-setup, day-of event, and several days after posts. This is a good opportunity to thank (and tag) attendees, sponsors, and vendors. – Ask guests to use your hashtag during the event to post their photos and start creating a buzz for your next event as well as your organization. Time is a precious commodity. In the non-profit world, it’s also a limited one. Laying out all aspects of your event ahead of time will help you reach your event goals effectively. – Start with a calendar (feel free to use this one). – Write in all your known deadlines. – Now write all your ideas for promoting your event in the side columns. Use suggestions from #3 and #4. – Create an actionable calendar using these ideas. – Don’t forget to plan your post-event marketing ahead of time. Chances are, the day or week after the event you’ll be too tired to think about follow-up posts and status updates! 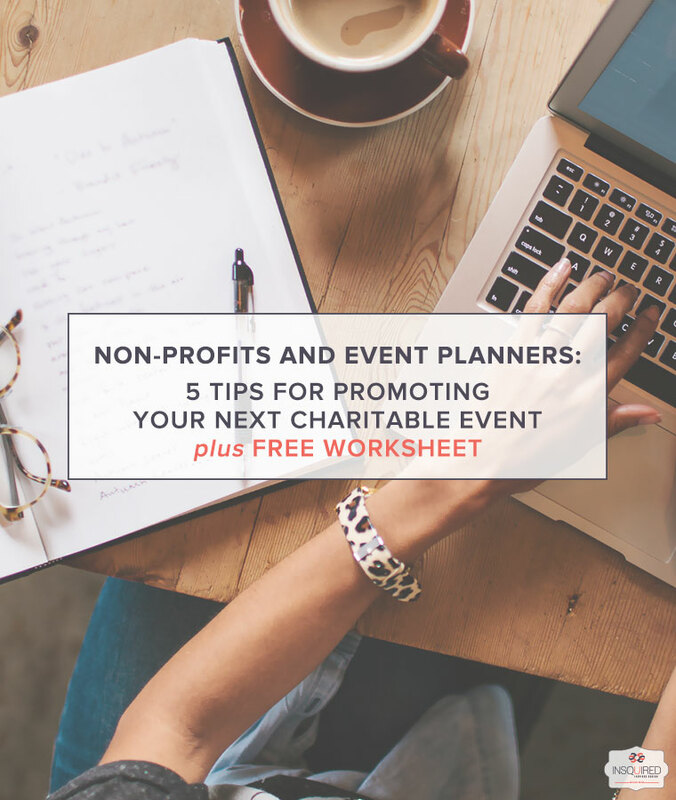 I hope these five tips prove helpful when planning your next charitable event. If you have any questions, or need help with additional ideas, you can reach me via email at . You can also find examples of events I have helped clients promote. Have a favorite event promotion tip? I’d love to hear it!